How do I submit to SSRN? How Do I Directly Submit To A Publisher? What Is A Digital Object Identifier (DOI)? How do I add subjects, keywords, or tags to my document? 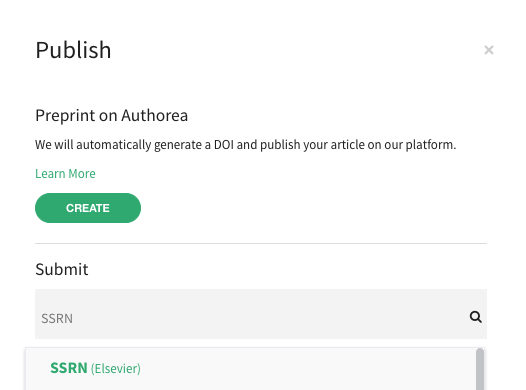 Authorea allows authors to directly submit their working papers to SSRN. To submit, make sure your document is complete and ready for submission then follow the following steps for submission. Search for SSRN in the search field. Test the submission by selecting Test Submission to download and preview your manuscript. If it is correct, please proceed to step 4. If not, please make the necessary edits. -note* please make sure the Author order on the PDF example is correct before submitting.